Harris Teeter celebrates the diversity of its shoppers and the opinions our shoppers have on food issues. We strive to serve each shopper at the highest level possible. Although Harris Teeter does not own or operate any animal processing facilities, it does assess its suppliers each year and uses the information to continually seek improvements in animal welfare for the products sold in its stores. Harris Teeter also believes in transparency around animal welfare issues and finds it valuable to include its shoppers in this discussion about the higher welfare foods available in its stores. As such, Harris Teeter is proud to share the following information with you. In its meat department, Harris Teeter is purchasing some of its chicken and turkey from producers using higher welfare, on-farm practices that are Certified Humane or using an alternative and more humane processing method called “Controlled Atmosphere Stunning” or “Controlled Atmosphere Killing” (CAS or CAK). Harris Teeter gives purchasing preference to suppliers using animal welfare-friendly, controlled-atmosphere processing systems. The CAS/K systems Harris Teeter supports through this initiative are approved by Dr. Temple Grandin, a world-renowned animal welfare specialist. Harris Teeter believes it is important to provide better welfare for animals including egg-laying hens and continues to bring attention to cage-free eggs. Harris Teeter has been a leader on this issue among conventional grocery chains. The company currently offers several types of cage-free Harris Teeter Naturals eggs and gives buying preference to cage-free eggs. The company plans to increase this percentage over time. 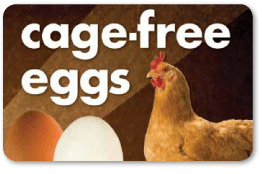 Look for cage-free signs in our stores today! Harris Teeter knows there are better, more humane, and more sustainable ways to breed pigs than by using gestation crates, which have been long-criticized over animal welfare concerns. We sell Niman Ranch pork, which has always been crate-free and has higher welfare, on-farm practices that are Global Animal Partnership-certified. It is Harris Teeter’s goal to have a gestation crate-free pork supply, and the company is committed to working with its suppliers such as Smithfield to accomplish that goal within a reasonable and feasible timeframe. Harris Teeter will continue working to ensure all fresh pork products sold at the company are gestation crate-free. All Harris Teeter milk comes from cows not treated with rbst/rBGH. 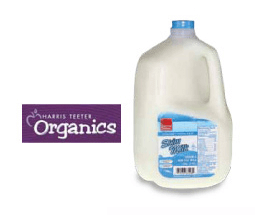 We encourage shoppers to try our Harris Teeter Organic Milk and we sell Organic Valley milk, as well. Harris Teeter requires its milk suppliers to undertake an animal welfare evaluation, such as the National Milk Producer Federation’s FARM program. We discourage dehorning of cattle. We encourage our suppliers to disbud their calves before two months of age (60 days) using a paste or analgesic, and we support farmers in developing successful programs for breeding polled, naturally hornless cows. Harris Teeter also discourages routine tail docking. Harris Teeter Rancher® beef and Harris Teeter Reserve® Angus beef are supplied by producers using a third-party monitoring system throughout the production process which ensures compliance with the North American Meat Institute’s (NAMI) animal welfare audit system, written by Dr. Grandin. The NAMI system prioritizes animal welfare during handling to produce quality products and maintain respect for animal well-being. In the meat department of some Harris Teeter stores, we also offer family-owned and operated DK Natural Meats. DK Natural Meats are raised without the use of steroids, antibiotics or growth hormones. We encourage you to try the Certified Organic Grass-fed Beef from DK Natural Meats, a USDA Certified Organic product with unsurpassed taste and texture. In 2012, Harris Teeter also began sourcing its Harris Teeter Naturals® Beef from Meyer Natural Angus. In some Harris Teeter stores, the company sells bison from Carolina Bison by DK Natural Meats, a family-owned and operated company located in North Carolina. For more information about Carolina Bison, click here. Harris Teeter sells a wide variety of devices to control rodents, but has made the decision to no longer sell glue traps. The Centers for Disease Control and Prevention warns against the use stating, "We do not recommend using glue traps …. These traps can scare mice that are caught live and cause them to urinate. Since their urine may contain germs, this may increase your risk of being exposed to diseases." Harris Teeter is currently and will continue to work closely with the Food Marketing Institute (FMI) and the National Council of Chain Restaurants (NCCR) to develop an industry-wide program that will strengthen food quality and safety. Our suppliers are required to monitor their handling of livestock and poultry, as outlined by the guidelines provided by the American Meat Institute.